Kartography is one of those books that leaves you longing for more at the end; a book that makes you want to go right back to the first page on completion and wonder why every reading experience isn’t as fulfilling as this. It is one of those books, where the realism in the fictional world, its characters and their thoughts, strike a chord. That, in essence, is what Kartography manages to do—tug somewhere deep at your heart strings and bring out a part of you that you believed had long been buried. The book is essentially a coming-of-age novel of the two protagonists, Karim and Raheen. They have an idealised childhood, sharing a unique bond, a friendship that few people have the reality of experiencing. They “finish one other’s sentences, speak in anagrams and lie spine to spine”. One summer day, both are sent to Uncle Asif’s farm to be shielded from the growing ethnic violence in Pakistan. Here, Karim decides to become a cartographer. This decision, seemingly random, seems to be inspired by Uncle Asif’s idea of formulating East and West Pakistan as testicles created for the phallus of India. The idea of cartography holds the book together; maps hold not just places, but also people together with the memories that each of these places stores in them. The holiday becomes important for Raheen too. She begins to take an active interest in their parents’s past, after reading the deep inscriptions on the tree with the initials of her father and Karim’s mother. Although she already knew that Karim’s and her parents had swapped partners before the wedding, this inscription acts as a catalyst and propels her into digging deeper. While the violence of Pakistan, the 1971 civil war, and the knowledge of their parents swapping partners forms only an insignificant part of their early years, slowly the gravity of these truths and the weight of this past that has carried onto the present start hovering around them. Karim, who is more politically driven than Raheen, keeps himself abreast of the escalating violence in Pakistan, trying to understand life beyond the elite, sheltered circle of Karachi, to which both of their families belong. However, Raheen is too preoccupied in her own closed world, refusing to see the truths outside. Suddenly, the dynamic of their relationship changes; words bear the weight of suppressed thoughts, giving layers of meaning, incomprehensible to the other. The transparency, which was the foundation of their deep friendship, is now clouded by shadows. Eventually, Karim migrates with his family to London and both of them are left to deal with some grave truths about their country and their parents, the misunderstandings only deepening in their letters to each other. Many years later, when they meet again, the friendship has turned into deep love, but the revelations of the tainted past have scarred both of them enough to forego this love. But is that really possible with ‘fated love’? Past and present intermingle in unique ways and so does the personal and political. The chemistry between Karim and Raheen is intriguing, although it seems a little too perfect at times. But given that childhood has always had such a charm, that could be pardoned. The use of anagrams and the idea of cartography to define multiple aspects of people and places and the equation that people share among themselves and with their land is extraordinary. 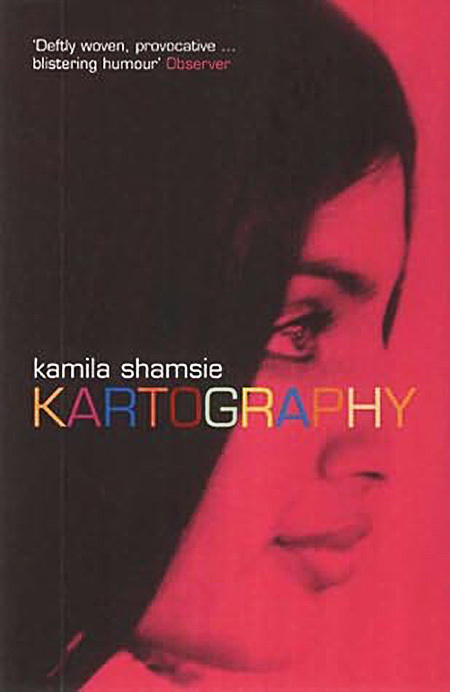 The fact that Kamila Shamsie is Pakistani and the book, for the most part, is set in Karachi hardly holds significance to those in the subcontinent. It could just as easily have been set in India, Bangladesh, or Sri Lanka. Ethnic violence, conflict, corruption, and politics of reservation—all these form a strong background to the novel and that is something most south Asians can relate to. However, what really stands out and deserves due credit is the personal-political dialectic that Shamsie creates, bringing together a nation’s history and its impact on personal equations; the way it alters life and creates permanent fissures. But, in doing so, she is also saying that ‘homeland’ is a concept that can inspire both love and hate, and that is the defining subtext of the novel. Kartography is certainly one of the best books that I have read, though it is not without its own shortcomings. At times, the history of the partition seems too contrived to bring deeper meaning to the plot and give it intensity. Shamsie’s love for her homeland is evident, but I wish she hadn’t used the chaos of Pakistan as the only tool to create multiple conflicts; as the only cause for relationships turning sour. Somewhere, the political aspect is overdone and one is left wondering if the book would work without the overwhelming presence of the background. Still, it is definitely worth a read, if not two.